For every good thing that comes out about vaping, there seems to be something bad. While most of the bad information is generally untrue, many people believe these myths which keeps them from putting down the cigarettes and giving vaping a try. Here are 10 common myths that everyone believes about vaping. Vape critics often say that e-juice, which is a liquid that turns into vapor after being heated, contains unknown chemicals that are dangerous. Since there are so many brands and varieties of e-juice, it’s important to know exactly what’s going into your vape mod. Quality juice should have its ingredients listed. If you’re worried about ingredients, some brands offer 100% organic juice to ensure its safety. Not too long ago, a myth was started when a study was published by the New England Journal of Medicine that made the claim that some e-juices contain traces of formaldehyde. This is a well-known carcinogen that’s found in cigarettes. The problem with the study is that researched heated e-juice to an extremely high temperature. The fact is that people who vape don’t vape at extremely high temperatures as this can cause dry-hits, which not only taste bad but can be quite painful. Another issue found in the study is that the researchers found traces of formaldehyde hemiacetals, which is a mixture of formaldehyde and alcohols. The effects of these chemicals are relatively unknown. While vapes do contain nicotine like cigarettes, it’s untrue that they cause cancer in the same way that cigarettes do. What many people fail to realize is that nicotine is not a carcinogen. What makes smoking so bad for your health are the byproducts that are created when lighting up a cigarette. Unlike their unhealthy counterparts, vapes do not produce arsenic, ammonia, formaldehyde, tar, or hydrogen cyanide. While regulations and rules that apply to the vape industry are relatively new, the fact is that the industry has self-regulated itself since day one. Most e-juice bottles contain nicotine warnings and encourage users to keep e-juice away from children and pets. Most e-juice is also made in a child-proof bottle and even shrink-wrapped to prevent accidental exposure. One of the many side effects of smoking is decreased cardiovascular health. Specifically, smoking can cause the heart’s arteries to stiffen. This increases the risk of heart attack and stroke. However, a study conducted at the Onassis Cardiac Surgery Center found that e-cigarettes don’t cause hardening of the arteries. While there are many studies underway to understand how vaping impacts the body, it’s safe to say that this myth can be put to rest. Many people falsely believe that non-smokers who start vaping are more likely to smoke. But, there are many reasons why people turn to smoking. Some do it to relieve stress and anxiety while others pick up the habit because of peer pressure and social expectations. There’s no evidence that vaping does the opposite of what it was created to do – to help people quit smoking. Because some people vape and continue to smoke, there is a myth that vaping doesn’t help people quit smoking at all. But, a variety of studies have found that vaping is an effective smoking cessation tool. In fact, it’s one of the most effective because it provides nicotine which means minimal cigarette cravings and minimized nicotine withdrawal symptoms. While the long-term effects of vaping are still being studied, many health organizations agree that vaping is much less harmful than smoking. Vaping doesn’t produce carcinogens and doesn’t impact those who may be exposed to the vapor, unlike cigarette smoke. We all know that second-hand smoke is dangerous, causing more than 7,000 deaths a year. On the other hand, there has been no indication that second-hand vape is dangerous. The vapor that is created doesn’t contain harmful carcinogens, unlike the smoke that’s created by a cigarette. Another big difference is that vapor clouds dissipate relatively quickly while cigarette smoke lingers in the air for minutes. The bottom line is that the vaping industry doesn’t encourage minors. In fact, there are many state regulations that make it illegal to sell vape supplies to minors. Despite the sweet and fruity flavors, the industry in no way purposefully encourages minors to pick up vaping. 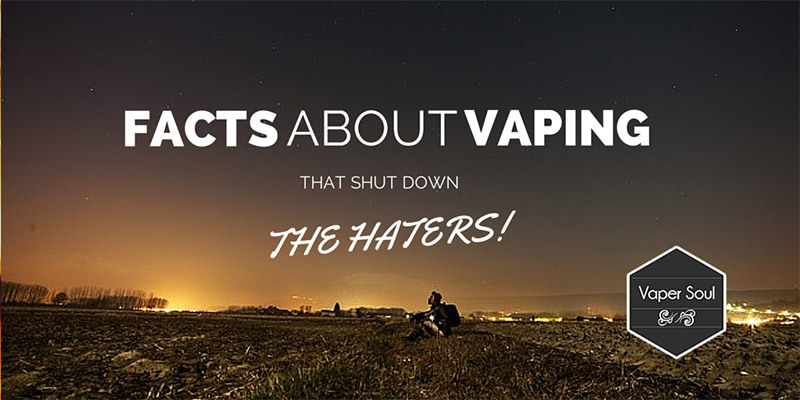 Since vaping is relatively new, there are all sorts of rumors and myths that surround it. If you’ve heard any of the myths above, you can have the peace of mind knowing that they are entirely untrue. If you have any questions or comments on the information in this article, share your thoughts in the section below.